Sure, it sounds great, but is it worth $600? Earlier this month, it was reavealed that Thrustmaster was working on a $500 controller for Gran Turismo 5 on the PS3. Aside from the basics about the steering wheel, not a whole lot was known at the time. Now, however, Thurstmaster has unveiled a lot more information about the device, including a release date, definite specs, and a price point that's about $100 higher than original reports suggested. The T500RS wheel and pedal set is specifically optimized for Gran Turismo 5, and the pedals are entirely made from medal. The wheel, meanwhile, is pretty insane in its own right. It features 1080Âº rotation (meaning you can spin it three times),16-bit resolution, and 65,536 values in its steering axis. The set also includes a textured metal foot rest. While it's not included with the set right now, there will be a gear stick available for purchase later on. 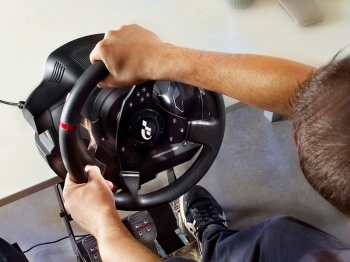 It sounds like Polyphony Digital's boss, Kazunori Yamauchi, is pretty happy with the rig: "The goal that I set for the Thrustmaster team was to design for me the most precise wheel ever developed, without any latency - to accurately reproduce the sensations of GT5, and let users truly feel the emotions experienced by drivers on real racing circuits." The T500 RS is going to launch in Europe in North America on January 5th and Japan on the 25th. It's got a suggested selling price of $599.99, €499.99, and Â£425. I'm one of those guys who's fine playing a racing game with a standard game controller, but it sounds like this is the device to play Gran Turismo 5 with, provided you're a racing junkie and your wallet can afford that kind of a hit.